To Cite: Sofia M, Latteri S, Randazzo V, Scibilia G, Galia A, et al. Laparoscopic Resection of a Solitary Fibrous Tumor of the Retroperitoneum, Report of a Case and Literature Review, J Minim Invasive Surg Sci. 2014 ; 3(4):e18452. Introduction: Solitary fibrous tumor (SFT) is a rare mesenchymal tumor that is usually located in the pleural cavity, but it can arise in any part of the body. SFTs can develop in the extremities, in the head and neck region, meninges, orbits, thoracic wall, mediastinum, pericardium, peritoneum, retroperitoneum, pelvis, adrenal glands, liver and urogenital system. Case Presentation: A 29-year-old female, was admitted in the gynaecology and obstetrics unit, for suspected pelvic tumor. CT scan showed a mass with hypervascular behavior and adherent to the uterus. The patient underwent laparoscopic resection of the mass. Abdominal exploration revealed a 5 cm mass, rising from the right iliac retroperitoneum above the pelvic space. The tumor was resected totally laparoscopically. The final histological findings were consistent with benign SFT. There were few mitotic cells (2 × 10 HPF) and a positivity for CD34 BCL2 and actin 1A4 and negative for CD117, desmin and CD99; MIb1 was < 5%. Conclusions: This is the first case of SFT of the retroperitoneum removed laparoscopically. The laparoscopic approach is useful for the advantages of minimally invasive surgery especially in case of peduncolate tumor as the case reported. Solitary Fibrous Tumor (SFT) is a rare mesenchymal neoplasm, described in 1931, for the first time, by Klemperer and Rabin as a pleura-based lesion (1). Despite this first description, it is now commonly accepted that SFTs is derived from mesenchymal rather than mesothelial cell, explaining numerous other extraserosal sites reported in literature (2). For this reason, it is now distinguished into two entities: pleural and extrapleural. Extrapleural SFTs can be found in any location: the most part is found in subcutaneous tissues, the remnants in the deep tissue of the extremities, in the head and neck region (including larynx, hypopharynx, parapharyngeal space, tongue, orbit, paranasal sinuses and nasal cavity), meninges, orbits, thoracic wall, mediastinum, pericardium, peritoneum, retroperitoneum, pelvis, adrenal glands, liver and urogenital system. Abdominal localizations are quite rare with 160 cases appearing in the literature (3), we report the first case of SFT of the retroperitoneum in the right iliac region, preoperative misdiagnosed with a pelvic tumor, treated by laparoscopic surgical resection. A 29-year-old female wa admitted in the gynaecology and obstetrics unit, for suspected pelvic tumor. During a follow-up control the transvaginal ultrasound showed a pelvic mass, suggesting an ovarian tumor. Past medical history revealed a laparoscopic resection for ovarian cyst 6 years before and diathermcoagulation of the portio 2 years before. Serum tumor marker levels, including CA125 and beta-HCG, were normal. Contrast enhanced CT scan of the abdomen and pelvis was performed confirming that mass with hypervascular behaviour and strictly adherent to the uterus (Figure 1). Thereby the patient underwent surgical resection of the mass by laparoscopic approach. Abdominal exploration revealed a 5 cm in diameter peduncolated mass, rising from the right iliac retroperitoneum above the pelvic space (Figure 2) and located between cecal appendix, external right iliac vessels and the ileopsoas muscle. The vascularisation of that mass was provided by new vessels from the infundibulo-pelvic ligament and external right vessels. After the opening of the peritoneum covering the mass, this was resected totally laparoscopically by using the vessel sealing system device (Ligasure TM). At the end of the procedure a closed drain was left in situ and the mass extracted by morcellation inside a plastic bag, without any splillage. The final histological findings were consistent with benign SFT. The tumor was composed of fibroblastic appearing cells, showing a characteristic "patternless" growth pattern with small fascicular areas. The vessels adopted a hemangiopericytoma-like growth pattern consisting of elongated and dilated vessels with thin walls (Figure 3). There were few mitotic cells (2 × 10 HPF) and no nuclear atypia observed in 10 high power fields, nor any tumor necrosis. Immunohistochemistry showed that the neoplastic cells were strongly and diffusely positive for CD34 and negative for c-kit (CD117) (Figure 4), and they were also positive for BCL2 and actin 1A4 and negative for desmin and CD99; MIb1 was < 5%. The patient underwent radical excision of the neoplasm and has since not been treated with any further therapies. She is still alive, after four years, without any clinical-radiological evidence of recurrence. It shows patternless proliferation of bland-looking spindly to oval epithelioid cells, admixed with thin collagen bands. 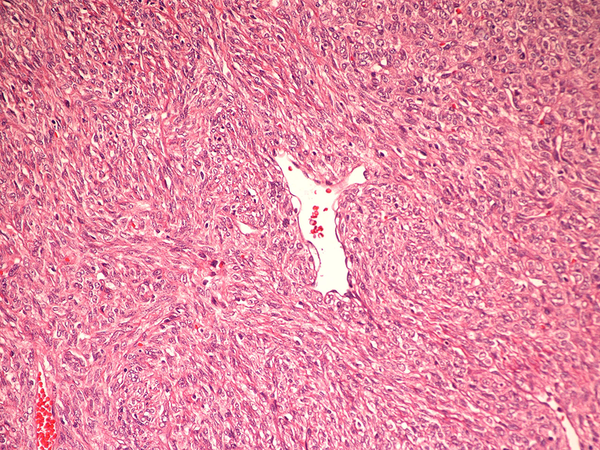 In some areas, tumor cells were arranged around ectasic vessels in a hemangiopericytoma-like pattern. A SFT is a relatively unusual neoplasm first described as a distinctive tumor arising from pleura. Extra thoracic SFT by now have been reported at almost all anatomical location, but reports of tumor in the retroperitoneum is quite rare with only 28 cases, including the present, reported in literature (Table 1) The most part of retroperitoneal SFT are reported by eastern authors especially Japanese. They were aged from 28 to 96 years reflecting a wide range of onset. The clinical presentation of SFTs varies greatly, presenting with symptoms related to the tumor site and size, or with systemic symptoms which include hypoglycemia, arthralgia, osteoarthropathy and clubbing (4). Briselli et al. have reported that approximately 4% of solitary fibrous tumors that develop in the pleura are associated with hypoglycaemia (5), while the incidence of hypoglycemia in the case of retroperitoneal solitary fibrous tumors has been reported to be approximately 11.5% (6). Our review shows an incidence of hypoglycemia of 14.2 %. A correct pre-operative diagnosis of SFTs is difficult because clinical manifestations, physical examination findings, and imaging results are not distinctive. On computed tomography findings, SFTs appear as well-defined, solid tumors containing cystic portions. In the present case, she had no symptom related to tumor. But, the mass was founded incidentally on gynaecological control examination. An abdominal CT revealed a well-defined heterogeneous enhancing mass. Only histopathologic evidence can allow a correct diagnosis of SFTs. 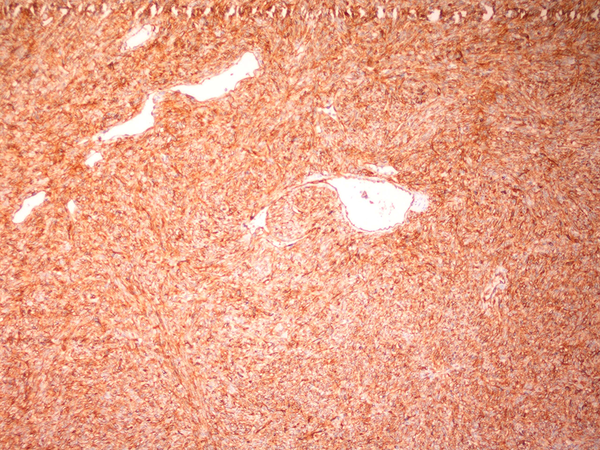 An intact layer of mesothelium overlying the tumor characterizes SFTs histopathologically. The pathological features of SFT were “paternless”, characterized by haphazard, storiform arrangement of short spindle or ovoid cells, and “hemangiopericitoma-like appearance” with prominent vascularity by thin-walled vassels. Immunohistochemically, expression of CD34 have been reported (7) as well as positivity for bcl-2 (8). Our patient had both patterns and coexpresses CD34 and bcl-2. Hasegawa et al. described that the numbers of MIb1 positive nuclei were low in all hystologically benign cases, ranging from 0.5 to 10% (mean 1.8%) (8). For this reason we defined our case as benign SFT. For the differential diagnosis of retroperitoneal SFT, the following malignant or benign spindle cell tumors should be considered: synovial sarcoma, nerve sheath tumors, hemangiopericytoma, leiomyoma, desmoid tumor, cellular angiofibroma, and gastrointestinal stromal tumor (9). Despite their unpredictable behavior, 10-15% of SFTs are aggressive. Takizawa et al. reported malignancy in 14.6% of patients with retroperitoneal solitary fibrous tumors (6). Local recurrence or onset of metastasis depends mainly on the following prognostic parameters: histological features (nuclear atypia, increased cellularity, necrosis, and more than 4 mitoses per 10 HPF), localization (approximately 10 to 15% of SFTs located outside the thoracic cavity are recurrent or metastatic), dimensions (> 10 cm) and resectability that is the most important factor (3, 10). Lesions located in the mediastinum, abdomen, pelvis or retroperitoneum tend to behave more aggressively than those in the limbs. Even the tumor appearance is a prognostic indicator, so polypoid, peduncolated tumours behave in a benign fashion regardless of their histological appearance, and the malignant cases are often poorly circumscribed, infiltrative masses (11). Because of the unpredictable behavior that SFTs display and the lack of consistent data in literature, surgery is considered the treatment of choice whenever possible, and only when radical resection is not feasible radiation and chemotherapy are applied. In literature surgical resection of these tumors is reported by open approach, often due to the large size of the mass. Only one case of bleeding SFT of the great omentum was approached and resected by laparoscopy (12). Our case is the first case of SFT of the retroperitoneum removed laproscopically. In conclusion we report a case of retroperitoneal SFT to emphasize the importance of bearing this entity in mind, to show that the characteristic microscopic appearance of this unusual tumour and immunohistochemistry are useful for differentiating it from other spindle cell neoplasms, and to underline the importance of a mininvasive approach. Laparoscopy, offering all advantages of a minimally invasive technique, is useful to remove SFT located in the pelvis, great omentum, gastric or small bowel wall, in the mesentere, and at list, as in the present case, even in peduncolated retroperitoneal tumor with intrabdominal growing. a Abbreviation: Na: Not available. Authors’ Contributions: Study concept and design: Maria Sofia, Domenico Russello. Acquisition of data: Saverio Latteri, Valentina Randazzo. Analysis and interpretation of data: Antonio Galia, Giuseppe Scibilia. Drafting of the manuscript: Maria Sofia. Critical revision of the manuscript for important intellectual content: Maria Sofia, Gaetano La Greca. Statistical analysis: Maria Sofia, Giuseppe Scibilia. Administrative, technical, and material support: Saverio Latteri, Valentina Randazzo. Study supervision: Gaetano La Greca, Domenico Russello.